1. Your Careers website is not veteran-friendly. When it comes to recruiting veterans, a one-size-fits-all Career website is not a good thing. Veterans come from a unique situation with a variety of skill sets and expectations. It is important to highlight the veteran culture at your company in a way that validates your veteran preference. Examples include listing press releases of your work with veterans, Veteran Spotlights, Partnerships Awards / recognition, and military-friendly HR policies. 2. Your Hiring Managers do not understand how to translate military experience. This is a major mistake that can lead to the loss of qualified veteran candidates. It is important to cross-reference your job descriptions with veteran skills and to educate your hiring managers on what military occupations translate well into what positions, as well as the intangibles that often make possibly less-experienced veterans more qualified for your positions. 3. Your hiring process is confusing and slow as molasses. In the military, veterans are given a clear course of promotion and are kept informed along the way. They expect the same in their civilian hiring process. Your hiring process should be clearly explained, including describing how long it takes and what is involved, and should move along at a good pace with good communication. Often, good veteran candidates are lost because they perceive a lack of communication to be a lack of interest. 4. Your hiring message is not appropriately targeted to veterans. When issuing messaging about hiring veterans, it is important to provide quantifiable evidence giving the number of veterans hired and giving legitimacy to their efforts through lists of their veteran perks. Simply saying, “We’re hiring veterans,” is not enough. A better message would be: Company XYZ has committed to hiring 100 veterans for technical positions throughout 2014 and 2015. 5. You don’t develop and train your veteran employees. Simply hiring veterans is not enough to continue to attract veteran employees. Veterans often expect that their career progression be clearly defined as it was in the military. Also in the military, they were given the tools to succeed through various schools and training. Civilian companies can mirror this structure through the implementation of Leadership development programs, Veterans affinity groups, annual skills assessments, and Mentorship programs. 6. You don’t understand the importance of referrals and word-of-mouth marketing. Most transitioning service members rely on referrals, their personal networks, alumni associations, or firms specializing in placing military. Often, they have never before been required to conduct a job search and tend to seek the counsel of fellow veterans that have previously made a successful transition. This reliance on word-of-mouth can hurt you in the military community, as a recent survey revealed that 83% of candidates in general tell their family and friends about their experience and 64% spread the word on social media. These six reasons can easily stand between your company and hiring from the most talented labor pool this country has to offer. But they don’t have to. With a little research, effort, and teamwork, companies can highlight their military recruiting efforts in a way sure to attract qualified veteran candidates. To learn more about how you can market your company to veteran candidates, click here. 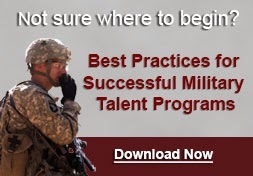 You can also view our Best Practices for Successful Military Talent Programs here. Seasoned manager experienced in administration, personnel, project and program management, training and development, and organization development. Flexible competent leader accustomed to managing multiple assignments and projects in fast paced fluid environments dependent on efficiency and accuracy. This is what I can offer and like anything I might need some additional training to fit the companies need but able to be trained and be a valued asset to any organization.